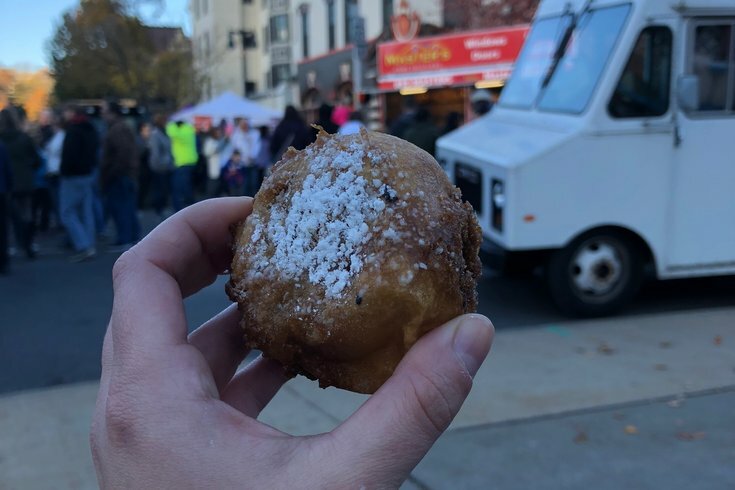 Sweet Girlz Bakery's deep-fried cupcake at BaconFest 2018 in Easton, Pennsylvania. Sweet Girlz Bakery, a business operating out of the Lehigh Valley, has added a new variety to its lineup of artfully crafted baked goods: deep-fried cupcakes. The new goods were a popular item during last weekend's PA BaconFest, the two-day festival held annually in Easton. The festival, which gathers thousands of bacon seekers and more than 100 vendors, had its fair share of bacon-themed desserts, including Sweet Girlz Bakery's bacon maple and pumpkin bacon cupcakes. As if those offerings weren't decadent enough, the bakery's kiosk at the festival had a deep fryer to make each cupcake into a joyful union with funnel cake. The bakery offers nearly a dozen different flavors for frying, including the non-bacon varieties of s'mores, peanut butter and strawberry. The fried layer has a sweet sprinkling of sugar on top for good measure. The shop considers the specialty the first of its kind in the Lehigh Valley. In addition to deep frying sweets, they've also come up with some creative new flavors for the fall, including a Weyerbacher Imperial Pumpkin Ale-infused cupcake that, the site warns, is not for children.